The founding team of new music service Slacker, which launched this morning, includes three former music startup CEOs (Dennis Mudd, Musicmatch, acquired by Yahoo), Jim Cady (Rio) and Jonathan Sasse (iRiver). And they’re going to need these guys and their connections, because Slacker isn’t just some new music service. They have broad reaching goals that bring them face to face with iTunes/iPod and Sirius/XM, as well as startups like Last.fm, Pandora, and every one of these services. The basic music service is very similar to Pandora (see screen shot at bottom of post). 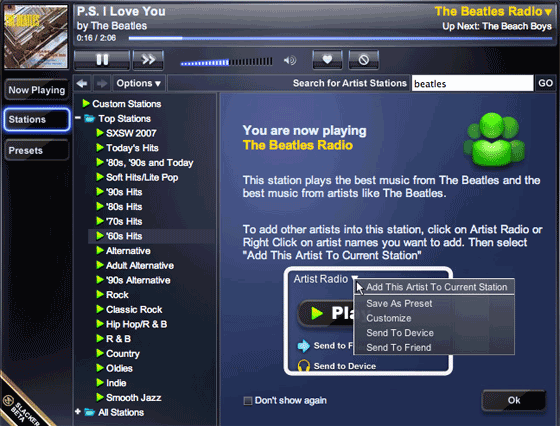 It’s a web based music player that customizes stations based on whether you like or dislike specific tracks. Like Pandora, you can’t play specific tracks on request, but you can certainly listen to a certain genre of music. Slacker is also trying to connect related songs, and in my limited testing it does a good job, although not as well as Pandora. This basic service is free and ad-supported (visual ads on screen only). Here’s where things get interesting. Although Slacker is only launching its web based music player today, they have PC based, iTunes-like software coming that will organize the music on your computer as well as play the same radio stations as the web based version. If you pay a $7.50/month fee, all “favorited” songs that you hear on the radio stations will be saved to your computer, and the ads will be removed from the service. And that’s not all, folks. Slacker also has hardware ambitions. They have a portable, iPod-like wifi enabled device coming, with a very large 4 inch color screen. 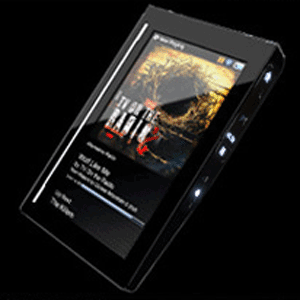 The device will automatically sync with the Slacker PC software via wifi and will also cache songs to be played on saved radio stations. The device will range from $150 to $300 based on storage capacity. Finally, they also have a satellite car kit in the works that will ensure that wherever you are, Slacker is with you. Since the only service available now is the web player, there isn’t a whole lot to review. But Slacker just picked a fight with just about every major online music company I can think of. Like the Zune and (I assume) future versions of the iPod (and don’t forget Music Gremlin), the portable device is wifi enabled. Their PC based software is a direct competitor to iTunes, and the service as a whole also competes with the plethora of subscription music services available. The satellite product may also lure customers away from Sirius and XM. So there are lots and lots of established players with loyal customers who are going to fight this thing tooth and nail. Slacker has raised $13.5 million in funding from Sevin Rosen, Austin Ventures and Mission Ventures – they will probably need a whole lot more to pull this off. Slacker is based in San Diego.